Inside every company there is a culture. In order to remain competitive, companies need to make cultural and process changes that are holding them back. How the employees respond is a critical predictive factor in the achievement of the desired outcome. What is the thing they like most about their position? What would they change? Have them explain why they are on this particular career path. What do they think about the company and its management? What do they believe should be done differently? Ask them who have been the greatest influences in their lives/careers. Listen intently and ask follow-up questions. Ask what they like to do away from work. Don’t make them uncomfortable. Make it known you are interested in getting to know them as people. Share what values are important to you and why. Provide some stories where appropriate—people relate to stories. Find out about their personal and career goals; share your own. Become vulnerable. Ask what you could do better to serve them and the department/company. Please remember to respond with empathy. Demonstrate sincere interest in what your people say, significance to them, and how they feel about it. 1. Delegate those things that would be helpful to you and to their development. 2. Select the most strategic person to complete the task(s). 3. When possible, get the employee to create a plan to complete the task(s). 4. Ask the employee to repeat back their understanding of the desired outcome and process. 5. Have a mid-point check-in on complex tasks. 6. Follow up in a positively. 7. Consider the rotating tasks. 8. Delegate tasks that enhance cross-training. 9. Try to include some delegation to everyone in the group. 10. Ask for input at the end of each task. Do I have awareness about my passions? What would I ideally like to look forward to each morning? How do I make this ideal happen? Discuss how the answers to these questions must factor into job responsibilities and performance. External Motivation: How do you reward your employees? The columns below offer employee types, potential felt needs, and some suggested rewards. For each employee, think about needs and rewards. (You may pull from categories more than once). 1. Employee feels disconnected from others. 2. Solid worker boasts of recent accomplishments. 3. Someone who displays a knack for learning and innovation. 4. 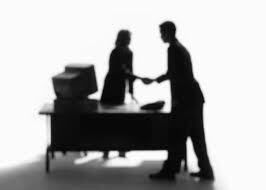 Turnover in a department causes an employee to withdraw. 5. A shining star complains about the lack of opportunity for advancement. 1. A letter of praise sent to the CEO and a copy of it given to the employee. 2. The right to select and manage a project. 4. An opportunity to gain some training & development. 5. An extra vacation day. 6. Involvement in a new committee/team. 7. Peer “attaboys” posted in lunch room. 8. Opportunity to lead a presentation/team. 9. Reassurance that his/her position is vital. 10. Role in developing a new company program. In times past, “good” salespeople had a method to close out a meeting with a prospect that was successful in getting them to “sign on the dotted line.” In some industries, the sales function is described as business development because of stereotypes of sleazy salespeople who use high pressure techniques to cajole an uncertain buyer into a (sometimes regrettable) decision. This is especially true in business services firms, where there is a stigma in many cases about seeking out new business at all. 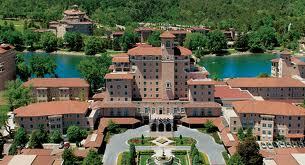 The biggest development of the past few decades has been the consultative selling approach. Yet, even this shift is not satisfactory for people who just do not like the word “sales.” When I have been working alongside attorneys and CPAs, for instance, the terms “client development” or “business development” are much preferred. In general, these practitioners provide offerings that have long sales cycles or are perceived as commodities. So…to unlock the motivation of my clients to do the development that is needful for practice growth, I usually have a series of conversations and trainings around the concept that client service requires a similar approach. Few argue that client service is needful. The 1950’s introduced this model, which concentrated on the product being heavily emphasized. This model is still in use today, usually in high-pressure sales. ➲ The salesperson is tenacious, persistent and usually has a low-cost item and works on a numbers game. ➲ The natural born salesperson enjoys interfacing with people and usually has an engaging personality. ➲ The salesperson builds a relationship, over time, with repeated visits. ➲ The buyer and seller get to know each other on a personal and professional level. ➲ Open-ended questions – Role-playing is used with students to get them to understand how to get clients or prospects to talk about the things that are important to them. ➲ Closed-ended questions – Closed-ended questions require a yes or no response. ➲ Listening skills is a key component. ➲ The salesperson takes the information and then presents solutions. VALUE ADD SALES MODEL (appeared in late 1960’s). Price objections raised by the “Problem-Solving Sales Model” can be countered by adding additional services. In this way, adding these services to the base product/service gives a perception of the value received versus the price. prospects soon tired of hearing the word. analysis, and legislation, as examples. It is important to think about your client base, your reputation and brand, your team–whether they are salesmen or technical people who happen to need to bring in business, and what your goal is. (Hint: a sale that is undone a year later when the client is not retained is not an accomplishment.) In general, it is best to educate and involve the prospect, help them feel good about choosing your company, and guide them through letting the current provider go. When we consistently approach prospects with consultative solutions rather than hard closes, then we are developing business rather than selling. Resist the Urge to Resist Change! Innovation is a word that is bantered about unwittingly by many. From its Latin root, it generally means to renew or change. Yet, many reduce innovation to invention—as in product-specific concepts come to fruition and production. If we faithfully apply the definition, innovation may be seen to pertain to any ideas to effect positive change that go from origination to transformation to implementation to systemization within an organization. To make the mental transition from viewing innovation as invention to what it really is, one must see innovation as culturally transformative. What was can no longer be what is, and certainly not what shall be. Change is hard for many people. Making a commitment to continuous change can be downright overwhelming. Yet, choosing to take action when others are stagnant can create tremendous strategic advantage. Look at Steve Jobs and Apple after the dotcom bust of the new millennium. As others shrank from R&D, fearful that the technology boom was forever dead, his group increased investment in innovation and they have prospered for it. Think Apple and technology are an isolated company/industry? Explain away the following mix of companies founded during poor economies: Disney, CNN, Hyatt, Burger King, FedEx, Gillette, AT&T, Merck, Coors, IHOP, Fortune, GE, and the Jim Henson Company. During the agricultural age, the asset everyone wanted was land and the critical success factor was yield. Agriculture gave way to industry with manufacturing and processing facilities and their efficiency defining success. As information became a greater commodity than industry, computers and their speed became the yardsticks. Today, in the creative age, innovation is the key asset and, as a means of differentiation, determines ultimate success. If your organization is to remain/become competitive in the current world economy and proliferation of information sharing, it is unlikely to do so without making a commitment to continuous improvement. Again, so as to not confuse this phrase with the Deming’s work in documenting kaizen approaches to manufacturing in Japan, let’s define what is meant. We are speaking here of a core value within an organization to not accept the status quo—to not become complacent. In a Business Week survey conducted in conjunction with the Boston Consulting Group in 2008, it was noted that total shareholder return (TSR) was greater over a three, five, and ten year period among business model innovators versus their industry peers. Notice that it was those who innovated their business model rather than those who tried to hold onto their old one who prospered! 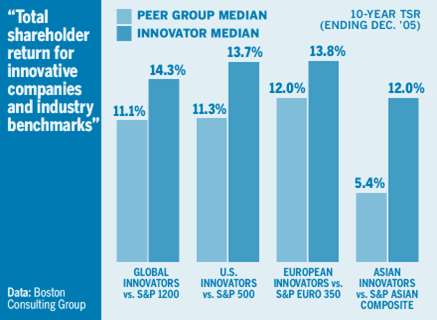 TSR was greater among global innovators than the S&P 1200, greater among U.S. innovators than the S&P 500, greater among European innovators than the S&P Euro 350, and greater among Asian innovators than the S&P Asian composite. In 1989, Smith Corona had annual sales of $500 million, producing typewriters. Word processing and computerization overtook their market position and they could not innovate fast enough to ride the wave. Jeremy Gutsche of trendhunter.com says, “Be wary of your strengths; success leads to complacency.” He maintains that, over time, most people stop trying. Need convincing? Gutsche cites each of these statements as examples of a pervasive attitude of entrenchment. Since most people are risk averse, we have learned to polish the “spin” on our actions and speak glibly of “tweaking” and “optimizing.” Instead, successful people and organizations must learn to pursue that which is splendid, unique, and paradigm-changing. The secret, though, is to not just produce an innovative product or service; to not just culturally innovate, but to commit to innovation and change continuously. Daunting? You bet it is! How can you lead yourself and others to protect the value that innovation has created? How can change be “maintained?” This is a rhetorical question—it can’t! Change cannot be maintained—it must itself be changed to remain responsive, relevant & vibrant!!! Is LinkedIn a Tool of Choice? With all the raving about Facebook, Twitter, and Google+, the redheaded stepchild is often LinkedIn. Too few business folks know how to make good use of this powerful tool. Some have a profile because they have been told it is a good idea. Others, because they have heard it is a good job search tool. Yet, there are so many ways that LinkedIn can help you become a better marketer. As the leading social media tool aimed at business executives, LinkedIn boasts 150 million users. As indicated in the infographic, most users subscribe only to the free version, with only about 8% who use the paid version with additional bells & whistles. Much has been written about the almost addictive level of engagement social networks enjoy; 12% of LinkedIn users spend 5-6 hours a week on the system, 26% are moderately engaged at 3-4 hours/week, and about 48% fall into the 0-2 hours category. When people use a social media tool, one of the primary motivators is to connect and network. However, about 30% of subscribers have 100 connections or less. Another 30% have 300 or more; approximately 40% have between 100 and 300. While we could get into a point/counterpoint discussion for hours on the value of quality versus quantity of contacts, that conversation would seem to apply only to the choice of LinkedIn strategy between the two groups with the largest number of connections. The larger question looms as to why some, claiming that they have created a profile on LinkedIn in order to connect, have only made 100 connections or less. Among favorite features, the Groups capability ranks highest, followed by the ability to search for people and the ability to be reminded of people we may know. Again, of those who join groups, fully 45% are members of 10 groups or less. It is important here to distinguish between members and participants. Most who are not “power users” of LinkedIn do not make the most of the Groups feature. By choosing not to read and respond to discussion board posts, the user decreases the value of the tool to themselves. When someone does use the search or people known features, they may not take the next step and ask for an introduction by someone who is able to help build the “triangle of trust” to the targeted contact. If it is not your habit of using LinkedIn for these important business functions, you are missing out on a great opportunity. LinkedIn is a tool of choice for those who understand its value. For it to become powerful for you, learn it better and explore ways to make the features work for you.